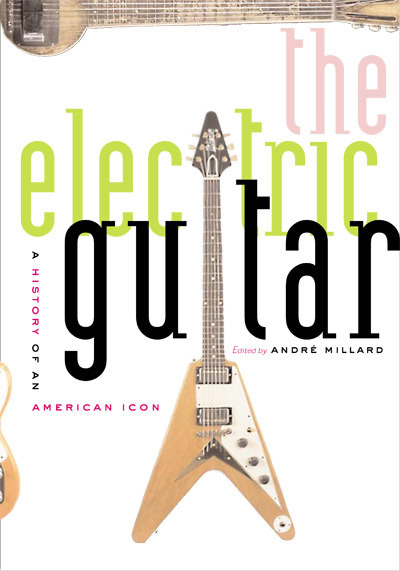 The Electric Guitar: A History of An American Icon (2004), edited by Andre Millard, explores the electric guitar's importance as an invention and its place in American culture. Since the guitar was first electrified in the 1930s, it has become an American icon and has transformed the soundtrack of our lives with its wide range of sounds—from seductive twang to howling distortion. Relatively inexpensive, easy to learn, and fun to play, the electric guitar is a truly democratic instrument. Millions have purchased Rickenbackers, Gibsons, Fenders, and other brands of guitars over the decades, fueling daydreams of fame and fortune. Cover design by Kristina Kachele Design LLC. In The Electric Guitar: A History of an American Icon, scholars working in American studies, business history, the history of technology, and musicology come together to explore the electric guitar's importance as an invention and its peculiar place in American culture. Documenting the critical and ever-evolving relationship among inventors, craftsmen, musicians, businessmen, music writers, and fans, the contributors look at the guitar not just as an instrument, but as a mass-produced consumer good that changed the sound of popular music and the self image of musicians. Avoiding the familiar stories, The Electric Guitar covers the careers and influence of guitar heroes such as Buddy Holly and Jimi Hendrix, but it also looks at lesser known but equally influential guitarists, such as Sister Rosetta Tharpe and Ike Turner. It also explains the importance of record producers such as Lee Hazlewood, effects pioneers like Roger Mayer, and electronics engineers such as Jim Marshall—all of whom played vital parts in constructing the sounds we associate with the electric guitar. From inventor's workbench to factory floor to recording studio, André Millard and his colleagues trace the development of the instrument, its use across musical genres, and its profound impact on popular culture and American identity. André Millard is the director of American studies and a professor of history at the University of Alabama at Birmingham. He is the author of America On Record: A History of Recorded Sound and Edison and the Business of Invention, the latter available from Johns Hopkins.